Desk partitions are commonly seen as giving employees increased privacy but a new study shows that people may be better off without them. (NEW YORK) — Desk partitions are commonly seen as giving employees increased privacy but a new study shows that people may be better off without them. Researchers from the University of Arizona looked at 231 office workers in four different office sites in the state. Employees worked in three different styles of office settings: “open bench configuration,” which had no partitions or very low ones, cubicles with high-walled partitions that workers can’t see over while seated and private walled offices. Participants wore heart sensors and physical activity monitors, which captured the intensity of movement in any type of activity, for three consecutive work days and two nights. During working hours, they also answered questions every hour on their smartphones to gauge their mood. Finally, they all filled in a survey to measure their overall stress levels. Workers in open plan offices with open bench configurations had more physical activity at work — and also outside of work — than either workers in cubicles (20 percent more) or in private offices (32 percent more). Also, those with higher levels of physical activity at the office, meaning those who work in open configurations, at the office had 14 percent lower stress levels outside the office. “This show us that design state matters,” said Casey Lindberg, co-author and research associate at the University of Arizona (UA) Institute on Place, Wellbeing and Performance, in an interview with ABC News. He said that he hopes this study will influence office design in the future, making designers mindful that some little known processes may contribute to employee health and wellness. Recent years have seen a rise in open-plan seating, away from the more traditional cubicle-style offices. 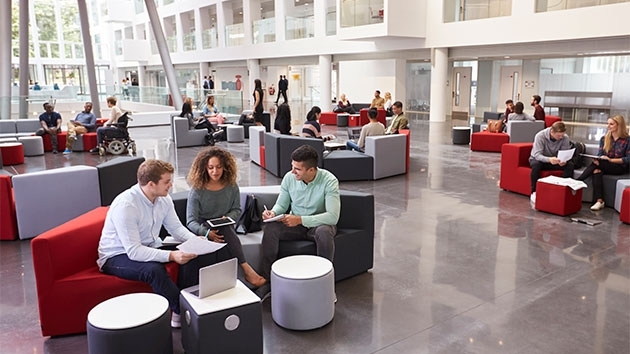 These collaborative, open concept spaces have received mixed reviews from workers and researchers, according to Cornell University. However, authors of the study urge people to look at it from both sides of the desktop. Dr. Esther Sternberg, M.D., lead author, director of University of Arizona (UA) Institute on Place, Wellbeing and Performance and research director at UA Center for Integrative Medicine, told ABC News that an “open office design” isn’t as bad as it may seem to some employees. She went on to add that when designing an office, companies should think about ways to make it most beneficial for workers. “It is important to consider the balance between the various designs to really implement ways to reduce the negative and increase the positive benefits of them all,” she noted. So, what exactly about open concept offices led to increased physical activity? Authors of the study are still uncertain of the specific causes and say that learning the specific mechanisms leading to increased physical activity will be a goal of research in the future. They speculate that people working in a dynamic space can walk to a collaborative space, or retreat to more secluded spaces for private conversations. Aside from these findings, the study suggests that an open concept may involve positive social effects, including more impromptu conversations, better communication and increased awareness of co-workers. “Overall, this is an important aspect to pay attention to if we want to optimize our health,” Sternberg said.